The complete program for solving your chronic foot pain. Are you frustrated with foot pain that just won't seem to go away? Do you have pain first thing out of bed in the morning? Have you had to change your lifestyle because your feet always seem to hurt? If any of these things sound familiar, you may be suffering from chronic foot pain. Our feet are vital to our normal life. They get us where we need to go, let us play sports, stay fit, and live normally. And we take them for granted until they start to hurt. What started out as discomfort has now taken over your life. You are not alone. Every year, hundreds of thousands of athletes and active people suffer from chronic foot pain. But you don't have to just live with it. You can fix the problems, and I can help. My name is Barton Anderson, and I am a certified athletic trainer. Over the last 12 years I have taken care of hundreds of athletes and active individuals, including those with acute and chronic foot pain. I know how frustrating these types of injuries can be. If you have foot pain that you can't seem to get rid of, read on to find out how I can help. Foot pain is caused by an irritation or inflammation of the tissues in the foot. That is why your arches hurt when you step out of bed in the morning, or after a run. No matter what type of foot pain you have, there are underlying factors that cause that pain. Unfortunately, most traditional foot pain treatments don't fix these underlying problems, and instead treat the symptoms. That works for awhile, but then the pain always comes back. The key to eliminating your foot pain and getting back your life is to fix the underlying mobility, flexibility, and strength problems. If you have tried other foot pain treatments and still have problems, it's time to try something different. Foot Pain Solutions is not like other foot pain programs. That's what makes this program work. Instead of focusing just on the foot, it expands to the surrounding joints and muscles to make sure the underlying problems are addressed. 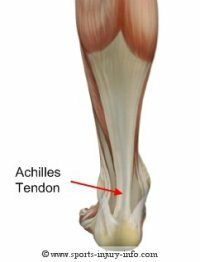 From achilles tendonits to plantar fasciitis, this program has the answers you are looking for to finally elminate your foot pain. Foot Pain Solutions is a complete program with over 30 exercises designed specifically for improving mobility, strength, and balance, and getting rid of your foot pain once and for all. Each exercise has been used with countless patients suffering from foot pain just like you. Foot pain solutions is a two phase program. Phase I focuses on improving mobility, flexibility, basic strength and balance. You will learn how to treat your foot pain starting from the beginning. Phase I will build a foundation for advanced strengthening, eliminating the underlying causes of your foot pain like mobility restrictions, strength deficits, and stability problems. Phase II focuses on advanced strengthening techniques. Not just for your feet, but the entire lower body. Not only will you be working to make your feet feel better, you'll be improving the overall function of the entire lower body. That means less chance for re-injury, and even improved performance. These exercises don't require fancy equipment, nor do they take hours on end to complete. You can do them from the comfort of your own home in just 30-40 minutes, 3 times a week. 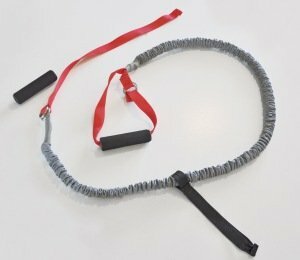 All you need is an elastic band, a little bit of time, and motivation to get better. You could completely eliminate your foot pain in as little as 6 weeks with this program...Just imagine life with no more foot pain. Foot Pain that won't seem to go away. Whether you are a competitive athlete, a recreational athlete, or just want to get back to pain free daily activities, this program can help you do just that. Can You Trust Me With Your Recovery?? If you have been searching for solutions to your foot pain, you have probably found a lot of information on the internet claiming to do everything I have discussed above. So why should you trust me with your Foot Pain recovery? As a certified athletic trainer, I am a licensed health care professional. 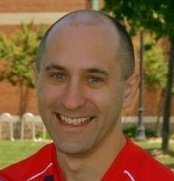 I have an undergraduate degree in athletic training, as well as an advanced Masters Degree in Sports Health Care. I am certified nationally by the National Athletic Trainers' Association Board of Certification. In addition to treating patients in clinical practice, I created this website - Sports Injury Info - to help people just like you find the information they need to recover from their sports injuries. I have dealt with athletes of all ages, sizes, and from all sports. From elite professional athletes, to recreational "weekend warriors", I know how much sports and being active mean to you. I also understand how frustrating injury can be. It takes you out of your normal routine - putting your life on hold while you recover. More than anything, I want to help you recover from your injury, and to reduce your risk for re-injury. Foot Pain Solutions is the sixth ebook in the "Solutions" series. To date, I have provided rehabilitation guidance to hundreds of people, just like you, who suffered from sports injuries. Injury rehabilitation and prevention are my passion, and I want to give you the best chance to recover fully and avoid future injury. I know the exercises in Foot Pain Solutions can successfully eliminate your foot pain and return you safely and quickly to your sports activities and daily life. I am so confident that this program will provide you with everything you need for a full recovery, if after trying Foot Pain Solutions you are not completely satisfied, I will refund your entire purchase price, no questions asked. Thats right - these exercises work, and to prove it, if for any reason you aren't satisfied with the information you recieve and the results you get, just drop me a note and I will gladly refund your entire purchase price. You have nothing to lose but time - Download your copy of Foot Pain Solutions today, read through the program, and start using these cutting edge exercises to eliminate your foot pain. 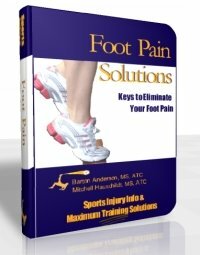 Foot Pain Solutions - an instantly downloadable e-book with over 70 pages of exercises and information. A comprehensive guide to the BEST exercises proven to eliminate problems associated with foot and ankle pain. The seven best exercises for improving mobility and flexibility. 12 base strengthening exercises that will eliminate your pain, and restore normal strength to you feet ankles. 13 advanced, total body functional exercises that will improve your balance, power, and performance. Week by week exercise progressions, tailored to keep you improving until you are pain free. Expert tips based on 20 years of combined rehabilitation experience. And a 100% unconditional money back guarantee..
With your purchase of Foot Pain Solutions you will recieve one on one customer support - so if you have specific questions about the ebook or don't quite understand an exercise, I am only an email away. Where else can you get a complete program of exercises proven to treat your chronic foot pain, improve your lower body function, AND get you back to sports, all for under $25? This will open your shopping cart with Foot Pain Solutions. Click on the yellow PayPal button to check out. You will be taken to a secure payment page and will be able to complete your order. You can pay using your PayPal account or credit card. Once your payment is complete, you will be redirected to the secure Foot Pain Solutions download page. If you are not re-directed, click on the orange "Complete Your Purchase" button on the payment page. You will also receive an email confirmation with your download link. The subject line will read "Foot Pain Solutions Purchase from Sports Injury Info"
Foot Pain Solutions is only available as a downloadable ebook. No physical product will be shipped to you. Downloadable ebooks allow me to offer this comprehensive program at this low price because I do not have to account for printing and shipping charges - so everyone saves! It also means that you will have instant access to the information - no waiting for a hard copy book to arrive. You can start the program in just minutes! You may be thinking to yourself "Can this guy be for real?" Many of my patients have asked the same thing...until their foot pain was gone. The underlying cause of foot pain and foot injuries can be a long list. Without guidance and the right types of exercises, you will be stuck in a never ending circle. No matter how much you ice, heat, massage, stretch, and rest, your foot pain may still come back. I developed Foot Pain Solutions to help you free yourself from chronic foot pain. But you can't benefit from the program unless you try it. How much is an injury free body worth to you? Download Your Foot Pain Solutions Today!